Spend a day scuba diving in Bali and explore some of the most fascinating dive sites in Nusa Penida. This scuba diving day trip begins with a wonderful boat ride across the Bali Sea from Padang Bai. At Nusa Penida, you'll undertake two open water dives, one each at Manta Point and Crystal Bay. Sprawling with beautiful natural corals, these dive sites often see Mola Molas and Manta Rays swimming past scuba divers. Depending on your prior certification level, you can dive to a maximum depth of 100 feet. A certified dive instructor will accompany you throughout the two dives. NOTE: A minimum of 4 travellers are required to book this trip. All prices in this package are subject to fluctuations based on international currency exchange rates at the time of booking. Nusa Penida, a small island off the coast of Bali, is home to the two dive sites of Manta Point and Crystal Bay, among several others. The rocky cliffs and pinnacles of the Manta Point are known for the majestic Manta Rays that are often spotted at the dive site. The gorgeous leather corals and sponges of the dive site are also home to other marine life including nudibranchs and nurse sharks. Visibility at Manta Point often extends until 80 feet. The dive site of Crystal Ray present more interesting terrain with bat caves, walls, canyons and sloping reefs. Crystal Bay is specifically known for sightings of the ocean sunfish, Mola Mola. Visibility at Crystal Bay often extends until 165 feet. 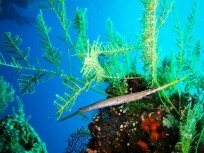 • Explore rich marine life and beautiful coral formations. • Spot the Manta Ray and Mola Mola species at the dive sites. • Spend a day admiring scenic views of the Bali Sea from the boat. Travellers are required to be certified as a PADI Open Water Diver before booking this scuba diving trip in Bali. For cancellations made more than 30 days before your scheduled Bali scuba diving trip: 100% refund. For cancellations made between 30-15 days before your scheduled Bali scuba diving trip: 50% refund. For cancellations made less than 15 days before your scheduled Bali scuba diving trip: no refund. All refunds will be processed after deducting any international payment transfer fees. Please check with us what these fees will be for this scuba diving trip in Bali. There is no pick-up for this Bali scuba diving trip. There is no drop-off for this Bali scuba diving trip. Go scuba diving in Nusa Penida! Report at the dive center in Padang Bai by early morning. You'll meet your dive instructor and begin the day with a boat ride to a few of the dive sites near Nusa Penida. En route, you can enjoy views of the beautiful, blue Bali Sea as far as the eye can see. Over the course of the day, you'll complete two open water dives and explore gorgeous corals teeming with exotic marine life. You'll be accompanied by a certified dive instructor during the dives. Lunch will be served on the boat between the two dives. The boat will return back to the dive center by late afternoon. Your trip ends here. Explore the big, blue Bali Sea at Nusa Penida. Arrive at your dive centre by early morning and head out for your two open water dives. Lunch is served between the two dives. Hot drinks and fruits will also be available. After completing the dives, you'll return back to the dive center by late afternoon.